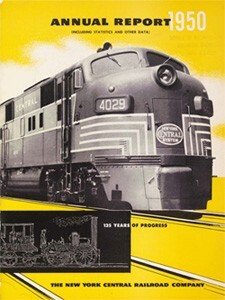 In 2007 a project was undertaken to digitize a selection of corporate reports from the Columbia Business Library's extensive collection of historical corporate annual reports. The selection targeted corporations that operated in and around New York City. Approximately 36 companies are represented with a total of approximately 770 individual reports (ca. 17,300 pages) ranging from the 1850s through the early 1960s. Columbia's diditized Historical Corporate Reports are available through Internet Archive. The collection can be viewed and searched at https://archive.org/details/culcorporatereports&tab=collection. Columbia University has provided access to these materials for educational and research purposes only. The University does not authorize any use or reproduction whatsoever for commercial purposes. The materials are displayed "as is" and without warranties of any kind, either express or implied, including any warranties of title, non-infringement of copyright or other rights. Materials in the Historical Corporate Reports Online Collection may be protected by copyright law. Materials that are protected by copyright law may be used only with permission from the copyright owner, or within the limits of fair use and other statutory exceptions. Columbia University makes no representation about the copyright status of the materials in the Historical Corporate Reports Collection and cannot give legal advice. If you wish to publish or reproduce materials in the Historical Corporate Reports Online Collection, please see: Columbia University Libraries Publication & Digital Reproduction Policy and Procedures. This project was a joint effort of the Columbia University's Watson Library of Business and Economics, the Preservation and Digital Conversion Division, and the Libraries Digital Program Division. The project was paid for by funds allocated from the Libraries Digital Program budget. Digitization was performed in 2008 on-site at Columbia by a commerical vendor (Backstage Library Works); pre- and post-processing tasks were handled by staff from the Business Library and the Preservation and Digital Conversion Division respectively.